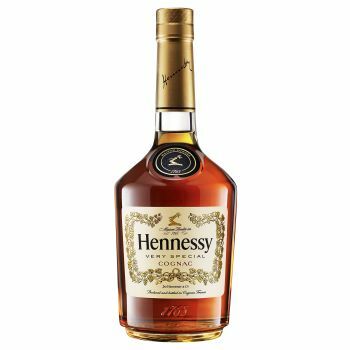 Hennessy Very Special is the modern-day equivalent of the original Hennessy Three Star, a designation created to indicate exceptional quality and savoir-faire. Predominantly matured in new oak barrels, the most popular cognac in the world is quite bold, and retains freshness and fragrance. Fundamentally Hennessy, yet finding its place completely in any era, combining its beguiling character with a joyful intensity, Hennessy Very Special displays toasty and fruity characteristics, with a rich, clearly defined palate and a welcoming exuberance. Upgraded in 2014 by Pininfarina Design Studio, its iconic bottle presents a more contemporary, masculine and asserted shape, bringing tension, intensity and power. Hennessy V.S expresses its urban, vibrant and dynamic personality through unique artist partnerships and limited editions each year. Easy to enjoy, it is a perfect cognac for high energy occasions and moments of sharing. Its blend is praised for its versatility. In fact, its roundness and strength gives many possibilities of tastings: from the classic recipes, sophisticated cocktails’ creations to simpler mixed drinks. About the product production: Cognac can only be made in the Cognac region in South West France. Cognac is made out of wine, the primary varietal being white Ugni Blanc. The region’s clayey and chalky soils sa well as a temperate climate are making the wines especially adapated for distillation. Hennessy uses four central crus selected from the best wine growers in the Central Region: Grande Champagne, Petite Champagne, Borderies, Fin Bois. After being distilled twice in copper stills, the spirits are preserved in French oak barrels. Then, each Hennessy cognac is blended based on a specific composition of eaux-de-vie which are selected for their aroma, age, and character. Hennessy Comité de Dégustation led by Master Blender Renaud Fillioux de Gironde (8th generation) embodies this Savoir-Faire passed on for 250 years. About the brand: From its seat in the French region of Cognac since 1765 and throughout its more than 250-year history, Hennessy has proudly perpetuated an exceptional heritage based on adventure, discovery and cultivating the best that nature and man can offer. Hennessy’s longevity and success across five continents reflect the values the Maison has upheld since its creation: the transmission of a unique savoir-faire, the constant quest for innovation, and an unwavering commitment to Creation, Excellence, Legacy, and Sustainable Development. Today, these qualities are the hallmark of a House – a crown jewel in the LVMH Group – that crafts some of the most iconic, prestigious cognacs in the world.